The Great San Francisco Earthquake struck on April 18th, 1906 (1906.295). Based upon our model that monitors also earthquakes due to their impact on the economy (1906 quake led to the Panic of 1907 and the formation to create the Federal Reserve in 1913). The risk for a major earthquake turns up in 2018. Why? Actually from two aspects. This will be the 13th wave of 8.6 years from 1906 which puts the risk starting 2018.095 (Feb 3/4. 2018). However, perhaps a more important model is simply looking at quakes that are 7.0 or higher regardless of where they are. When we focus on this level of activity, here too what emerges is a 31.4-year cycle of intensity. This also turns up in 2018. The real intensity appears to extend into 2021. There is a new theory that some scientists have put forward. This new theory was published in Geophysical Research Letters earlier this year, by Roger Bilham of the University of Colorado and Rebecca Bendick of the University of Montana. Their hypothesis predicts that because of Earth actually slows down in its rotation, there will be a sharp rise in large earthquakes come 2018. The forecast is based upon looking at earthquakes since 1900 that were greater than 7.0 displays a cycle that is approximately every 32 years for an uptick in these large quakes. They argue that the only factor which strongly correlates is a slight slowing of the Earth’s rotation in a five-year period before the uptick. While I cannot confirm or deny that the cause of the cycle is the slowing of the Earth’s rotation, I can confirm that the cycle exists. Indeed, a Magnitude 7.0 earthquake hit 45 miles from New Caledonia on November 19th, 2017 at 5:43 PM. 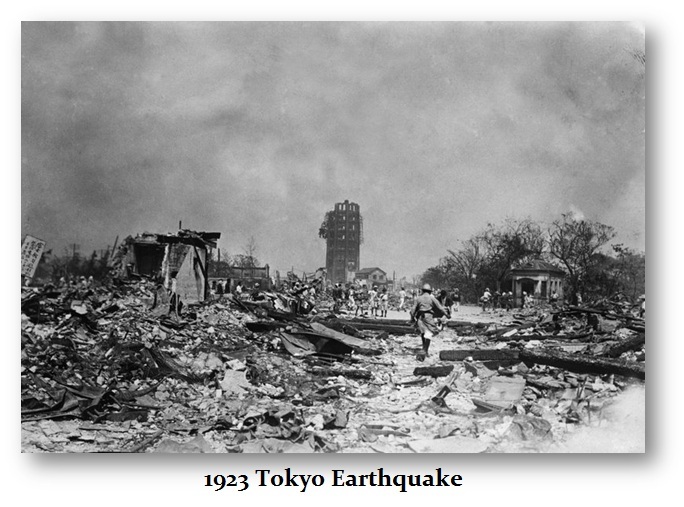 The Tokyo Earthquake of 1923 came 17.2 years after the San Francisco Earthquake. That was two 8.6-year waves after 1906. 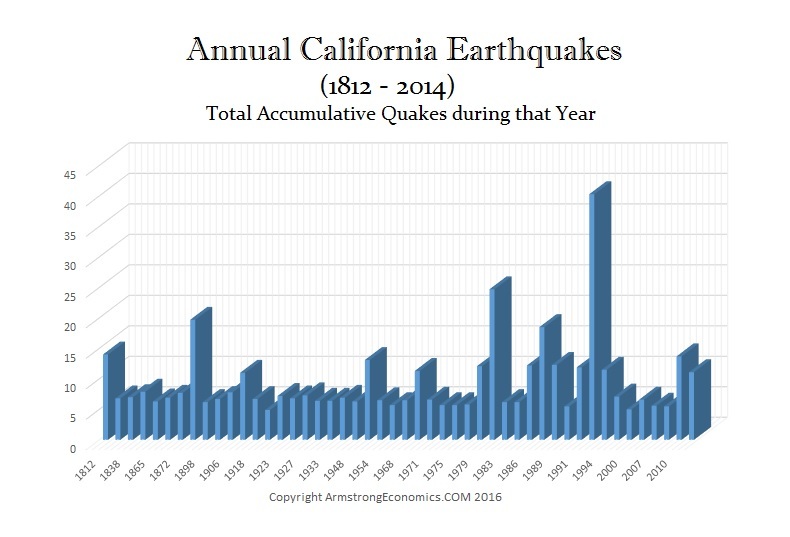 The 17.2-year frequency for 7.0+ quakes was due then in 1940. On May 19th, 1940, Imperial Valley, California, in the United States was hit by a 7.1 quake which was followed by the November 10th, 1940 Vrancea, Romania quake registering 7.4 in magnitude. The next 17.2-year target was 1957. Here we hade four major quakes hit; March 9th, 1957 Andreanof Islands, Alaska coming in at 8.6 in magnitude, April 25th, 1957 Fethiye, Muğla, Turkey with a 7.1 quake, May 26th, 1957 Abant, Bolu, Turkey at 7.1 in magnitude, and December 4th, 1957 Govi-Altai Province, Mongolia with a 8.1 quake. The next 17.2-year target was 1974/75. This produced four quakes starting on October 3rd, 1974 Near Lima, Peru registering 8.1, then February 4th, 1975 Haicheng, Liaoning, China 7.0, May 26th, 1975 North Atlantic earthquake 7.9, and July 8th, 1975 Bagan, Myanmar, coming in at 7.5 in magnitude. The next target was 1992 which produced three major quakes starting on April 25th, 1992 Cape Mendocino, California, at 7.2 in magnitude, followed by the June 28th, 1992 Landers, California, at 7.3 on the scale, and September 2nd, 1992 in Nicaragua with a 7.7 quake. The next target was 2009 corresponding with the low in the Crash of 2007-2009. 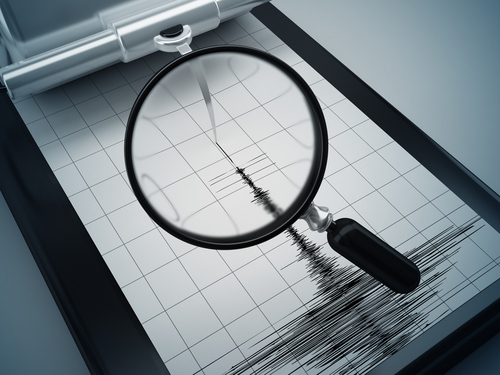 The financial market6s captured the headlines that year, but there were 16 earthquakes in 2009 alone that measured 7.0 or greater with one exceeding 8.0. The next target for intensity will be 2026. The coming year of 2018 will be the start of an uptick in earthquake intensity. Of course, this is a worldwide model and not one specific to any single city. Today almost every Internet user visits Youtube or any other service to upload and watch entertaining videos, free movies and other video content. But sometimes you want to download a movie or a video and the service doesn’t allow you to do so. It’s where Vidmate App is coming to help you out. It provides with an ability for you to get a movie from may services, including YT, Facebook, Vimeo and many others. To do this you simply need to find a video and click “download”. Plus, the app is free of charge and easy in use! Download Vidmate now and start downloading your favourite movies to share them with your family!